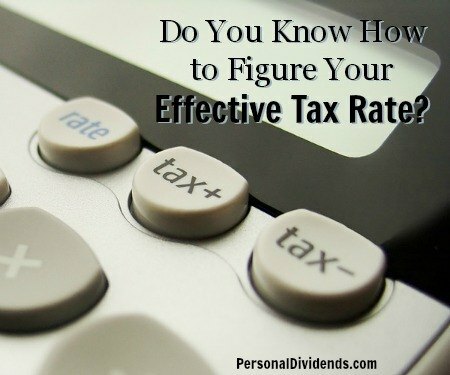 Do You Know How to Figure Your Effective Tax Rate? Many people look at marginal tax rates and become concerned that they will have to pay that amount on their entire income. However, this is not the case. The marginal system works by only taxing amounts that exceed a certain level. Now you add up those three numbers to see that you pay $8,361.25 in federal taxes. As you can see, your marginal tax rate is not the rate at which you actually pay taxes. The rate which you actually pay taxes is known as your effective tax rate. There are a number of ways that people use to figure an effective rate. The simplest way is to just use the information from your tax return. All this means is dividing the amount you actually pay in federal taxes by your taxable income. In the example above, that means dividing $8,361.25 by $50,000 to get an effective tax rate of 16.72%. That’s a bit different from the marginal rate of 25%. Of course, figuring your effective tax rate isn’t always that easy. Some people suggest that you figure your effective tax rate using your gross income, since deductions can lead to a somewhat significant difference between your actual earned income and your taxable income. Your taxable income might be $50,000, but before deductions, your total earned income might be $65,000. In that case, your effective tax rate drops to 12.86%. Once you add up what you pay in all these taxes, and put it on top of your federal income taxes, there is a chance that your effective tax rate could go higher. It’s important to note that not everyone pays the same taxes. You might not be charged sales tax in your state. If you aren’t self-employed, you don’t have to worry about paying that tax. Additionally, there are some taxes, like FICA/payroll, that take less of your income the more you make. Since FICA is only taxed on the first $113,700 of income, those with higher incomes might see a shrinking effective tax rate in comparison to those workers who continue to pay 6.2% of all of their incomes in FICA/payroll. Your effective tax rate will depend on the factors you include in your calculation, as well as what specific taxes you are subject to. The effective tax rate is a better gauge of how much of your income goes toward paying taxes than the marginal rate, no matter how you decide to calculate your effective rate. Thanks for sharing this valuable information. I wasn’t of how to calculate.